Hi, I'm Thomas Fuchs. I'm the author of Zepto.js, of script.aculo.us, and I'm a Ruby on Rails core alumnus. With Amy Hoy I'm building cheerful software, like Noko Time Tracking and Every Time Zone and write books like Retinafy.me. Want me to speak at your conference? Contact me! That was indeed a very accurate way of putting it, as only now Google is catching up, with Chrome for Android. If you’ve done any serious mobile web development, you know that the built-in Android “browser” is a joke compared to Safari on iOS. 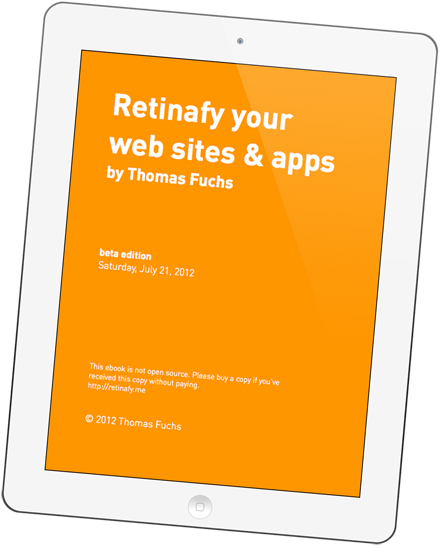 Free bonus: get a $5 off coupon code for my Retinafy ebook when you subscribe! Does your time tracking have GitHub and Beanstalk integration? Thanks to Retinafy.me readers, $1,044 go to kids in Ferguson! Get retinafied and support kids in need! What to do when Stack Overflow is down? Questions, corrections or constructive criticism? Write me an email. Want to support me? Get a subscription to my time zone converter!